MOSCOW, Russia -- Nobody, apart from Vladimir Putin, Russia’s president, knows what awaits Ukraine. If the Kremlin stops at the annexation of Crimea, the rest of Ukraine may survive and reform itself into a modern European state. If, on the other hand, Mr Putin moves deeper into Ukraine, the country may descend into a bloody partisan war. Russian troops were reported to be massing on the eastern border of Ukraine as The Economist went to press. Worryingly, the Kremlin justifies its actions in Crimea by citing a need to protect the Russian-speaking population, which would equally justify a military operation in the south and east of the country. Mr Putin sees himself as not just the president of Russia, but as a protector of the “Russian World”, an ill-defined conglomerate. His idea of gathering historic Russian lands into his own fief has pushed Kiev, the cradle of Russian cities, farther away from Moscow than it has ever been. Yet it is not just Ukraine that faces a threat from the Kremlin. And whereas Ukraine may yet shake off the Kremlin’s grip, the chances of Russia’s becoming a modern, civilised country, open to the world and respectful of its citizens, are diminishing with every outburst of war hysteria on Russian television. This marks a new period in Russia’s post-Soviet history, rather as the Soviet invasion of Czechoslovakia in 1968 marked a new chapter in the Soviet empire’s post-Stalinist history. The tanks in Prague crushed not only Czech reformers, but also hopes among Russians of building a more humane socialism at home. Similarly, Russia’s escapade in Ukraine entrenches its own authoritarian, oil-dependent and fundamentally weak state. The Ukrainian revolution last month posed an existential threat to Mr Putin’s paternalistic and kleptocratic system by prompting the question: if Ukraine can cut itself off from the Soviet legacy, why can’t Russia? In preparation for Russia’s actions in Ukraine, the Kremlin cleared the last pockets of independent media. Ria Novosti, a state-news agency, which sheltered loyal but liberal-minded journalists, was purged and turned into a blunt propaganda instrument. TV Rain, a private television channel which provided the most objective coverage of the Ukrainian protests, was taken off the air by the main cable providers, acting on the Kremlin’s instructions. The internet, once free of Kremlin control, has been restricted by new, vague laws. On March 12th the editor of one of the most popular news sites, Lenta.ru, was replaced with a pro-Kremlin appointee. Dmitry Peskov, a spokesman for Mr Putin, labelled anyone objecting to the Kremlin’s actions part of a “nano-sized fifth column”. A patriotic frenzy whipped up by television muffles any dissent. Television executives who were trained as part of their Soviet-era military services in “special propaganda”, which sought to “demoralise the enemy army and establish control over the occupied territory”, created a virtual enemy in Crimea—fascist revolutionaries whose overthrow of the legitimate government justified the movement of real troops. People close to Mr Putin say he had been harbouring the idea of taking Crimea since the war in 2008 with Georgia, which resulted in the de facto occupation of Abkhazia and South Ossetia, its two breakaway republics. Yet the context is different. Kirill Rogov, a political columnist, argues that the war in Georgia served as a patriotic accompaniment to Russia’s economic resurgence. Ukraine serves as its substitute. 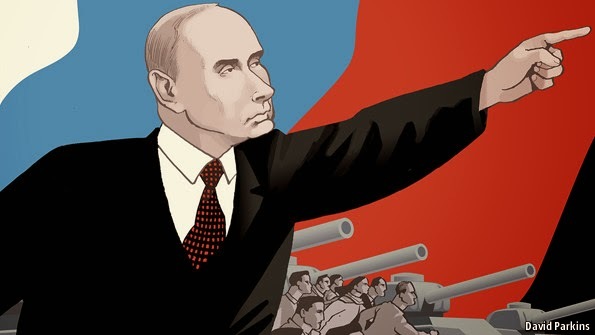 Russia’s economic stagnation has exposed the limits of Mr Putin’s political and economic model, which relied on rising oil revenues and allowed him to buy the support of the elite and the acquiescence of the population at large. Real disposable incomes, which rose by 12% in 2007, on the eve of the war with Georgia, are forecast to rise by 3% this year. The Kremlin faced a choice between political liberalisation and mobilisation of the country by the means of war and repression. Mr Putin has chosen the latter. Confrontation with the West is one of the main goals of Mr Putin’s operations. Any sanctions imposed will allow him to blame Russia’s economic downturn on the West, though that may not placate the ruling class, with its cash stashed abroad in property and bank accounts. Mr Putin has tried to reduce the elite’s vulnerability to sanctions by warning it to repatriate its money and even passing a law banning the ownership of foreign bank accounts by Russian officials. Yet there is little sign those measures have had any effect, and Mr Putin’s actions are bound to damage the wider Russian economy. They will accelerate capital flight, raise the cost of borrowing and restrict new investment. This could lead to a fall in the value of the currency and in living standards. Although Russian sabre-rattling has given Mr Putin’s ratings a short-term boost, it is unlikely to arrest the growing discontent with his policies for long. As Andrei Zorin at Oxford University notes, the militaristic euphoria was even stronger 100 years ago when the tsar dragged Russia into the first world war. Two years later, that enthusiasm had vanished and the Russian empire started to crumble. As part of the mobilisation the Kremlin organised a Soviet-style letter, endorsing Mr Putin’s policies, from famous cultural figures such as Valery Gergiev, a celebrated conductor. But another letter, sent to Mr Putin by a journalist from Vologda, the heart of Russia, provides a clue as to how some ordinary Russians feel. “Could you also send the troops to the Vologda region?” it said. If they are any volunteer from Russia in Donetsk region and Kharkiv region, perhaps police and Interior forces may conduct rigorous, random document check of people in public places. Most active could be detained for period of time to verify their identity. Perhaps it may complicate pro-Russian efforts.